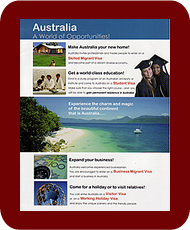 At the present time - and for the foreseeable future - Australia's immigration focus is firmly on EMPLOYMENT: in dealing with visa applications DIAC is giving priority to applications from people who have been offered a job in Australia or who are certain to get a job in Australia soon after they arrive. If you want to settle as a skilled migrant in Australia as quickly as possible (and you meet all the standard skilled visa requirements), it is best to have a job lined up for you. But how do you do this? These days the quickest route to a Skilled Visa is THE OFFER OF A JOB! In this critically important section of our web site we will give you our answers to the question of what you can do to get offered of a job in Australia before you apply for a visa. We say "answers" - plural - for there is no single answer, the answer depends of where you are at the moment - overseas or in Australia - as well as on a number of other things, as we will explain. What Hapiness! I can’t believe that only 6 months have gone by since you started providing advice to us and my employer, and we are permanent residents and have full-time employment in my field. One thousand thanks! My husband is sending greetings and both of us are sending you a big hug. If you are currently overseas, go here to read the advice we would give you (some of which may be of interest also to people who are already in Australia). If you are currently in Australia, go here to read the advice we have for you (some of which may be of interest also to people who are currently overseas). To help our clients land a job in Australia AMES has formed an alliance with AustJOBS, an agency that focuses on matching prospective migrants wth prospective employers who are interested in sponsoring international professionals and trades people.